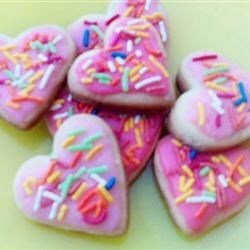 "This is the easiest and the best tasting sugar cookies you will eat. It's so easy kids will always request it!" In a medium bowl, combine the flour and confectioners' sugar. Stir in the melted butter, egg, and vanilla until well blended. Cover, and refrigerate dough for at least 2 hours. On a lightly floured surface, roll the dough out 1/4 inch thick. Cut into desired shapes using cookie cutters. This cookie recipe was quick and easy to make, but no one liked the cookies!